What a busy week it's been so far and it's only going to get busier! But, I'm so excited about Christmas, and the chance to spend time with family, that I don't care how busy I've been. My apologies for being MIA until now; I was getting some great Christmas shopping done on Tuesday and that left me pooped out yesterday (I was a total zombie from fatigue). Even with that shopping done, I still have a huge to-do list: cleaning, dressing the table, grocery shopping, and a few last minute DIY projects that I need to tackle to complete our Christmas decorations (including printing out my DIY gift tags, eek!). Speaking of DIY projects, I had to share with you the site, The Lovely Cupboard, because it is chock-full-of great DIY projects including the one in the photo above. 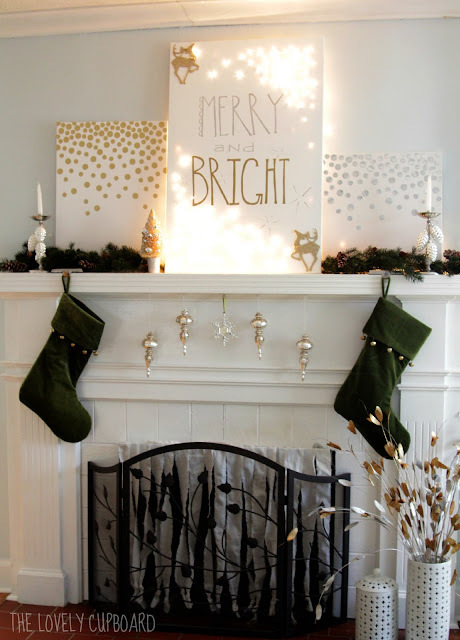 I secretly want to create something like the lighted board for the nursery... Hopefully you are all done with most of your preparations and are not last minute like I am! I'm still assembling the Cast of Thousands!